It’s time to let your voice be heard! 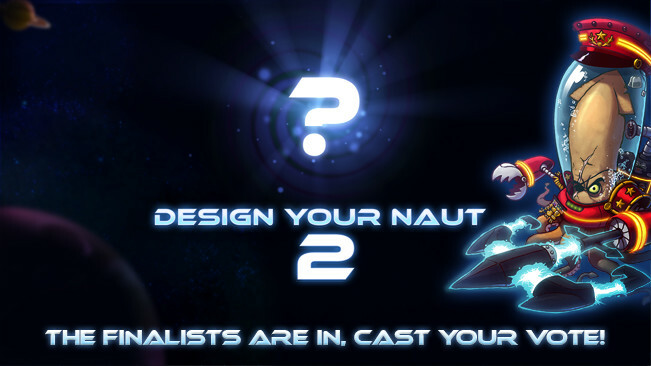 We’ve selected our favourite five ideas out of the more than 900 submissions for the Design-A-Naut contest, and need your help to pick the character that will eventually make it into the game. They’re all so awesome, we just can’t decide ourselves! Click here and vote for the design you’d like to see in the game. The idea with the highest number of likes by the end of Friday October 16th is the one that wins, so check them out and let your voice be heard! Will it be P. Geist, the Hardboiled Detective Ghost? Or the twins from the True Talon Monastary, called Ow Ling & Ow Lei? Valentina, the Ancient Spear-Wielding Warrior currently leads the pack, but Ix the Interloper (the Crystalline Being from Luxor) and Samuel the Time-Travelling Mercenary from the Future can still catch up! Check out the full designs on our page, and vote for your favorite! Thanks to everyone who submitted their awesome concepts over the last couple of weeks. We had an incredibly hard time narrowing down the massive list to just five different concepts, but we can’t thank you all enough for the amazing amount of fantastic ideas, incredible inspiration, and general awesomeness of your submissions!